Woof. Woof. Who let Neil’s dogs out? You can win a dog bowl autographed by Neil Young, according to the Winnipeg Free Press. The Winnipeg Humane Society launched its first Celebrity Dog Bowl Auction today. Visitors to its website, winnipeghumanesociety.ca can bid on 20 autographed bowls signed by the likes of Young, Underwood, Rihanna, Fleetwood Mac, Joan Rivers, George Takei or even the dog whisperer, Cesar Millan. Funds raised from the auction will go to the Humane Society. Those interested have until March 23 to submit their bids. “This is a huge gesture, as it helps raise awareness and much-needed funds for the thousands of animals that come through our doors,” said Bill McDonald, the Humane Society’s CEO. 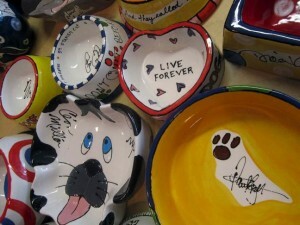 The bowls were donated and decorated by Winnipeg’s Brush Fire Ceramic Studio.